PLEASE CLICK ON THE NAVIGATION BUTTONS AT THE TOP TO FIND OUT MORE ABOUT US. Summer’s stuttering into our lives now that April’s here… We’re settling into our new home. Our regular sessions continue for our members most weekdays now, to make and mend, but we’re still titivating our ‘new’ shed… We have 32 active members this year so far - please come and ask if you are thinking of joining? Click on ‘Join Our Shed’ above to find out more. We’re located in the outbuildings behind ‘Southdown Galleries’ in Henfield High Street. Our generous sponsors have enabled us to start from scratch in just a few months! In addition local support has been received. Our founding Steering Group, Trustees and Members would like to express our profound gratitude to them all. Ten months after the initial meeting to discuss the possibility of starting a Community Workshop in the village, we opened the doors to welcome Members for the first time on Tuesday 23rd January 2018. Opening several days of the a week now, and with more members joining our numbers continue to swell. Our members now meet in our new space on at least three days a week to meet each other, work on a list of activities and projects and drink hot beverages with biscuits… sometimes even cake! We now have a rota of Shed Supervisors opening the shed for members’ workshop sessions. If the sign is outside you’ll be welcome to have a chat and find out more about us. We have a broadening range of creative projects under way on behalf of other organisations in the village. You can see some of the completed work on the What We Do page. Members are forming groups to start sessions to work on their own projects in the shed, with help and training from other members with similar interests. Please explore the rest of our website by using the buttons at the top of each page. Our efforts to become better known in the village and surrounding communities has really paid off, and we are rapidly becoming the ‘go to’ group for making and mending various items. See our ‘What We Do’ page for much more detail on recent things we’ve been involved in. As always The Henfield Shed seems to get busier and busier and involved in more and more of the local community’s practical problems. Our current Trustees are Zena Cairns, Neville De Moraes, Pete Gumbrell, Tim Perrin and Peter Tiplady. 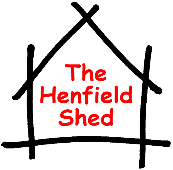 Please feel free to contact any of us should you have any queries or questions about The Henfield Shed. Don’t forget we’ve established a new FACEBOOK presence - it’s embedded below and if you click on it a new page/tab will open on your computer/device to allow you to explore it more. Of course if you are already a user of Facebook you can simply search for us there. We’ll move the box below to another page here in a month or two, though, so you’ll be able to find it even if you aren’t a subscriber to facebook. But first…. Can you help Pete with some sponsorship? Alongside the creation of the numerous Bug and Bird boxes we have been recently been asked to complete various furniture repairs, installing shelves, new signage for the Haven, a memorial plaque renovation, a wooden planter, children's bricks and a wheelchair ramp for St Michael’s Church, Partridge Green. All of these pieces of work have generated donations for us from the local community. So what is next? We are taking part in this year's Gardens & Arts Weekend and we have been asked to build 10 x 'fun' bird boxes for this event. For the Fayre on the Common this year we need to build 3 x games for children to play. So if you fancy helping with these creations please come along.